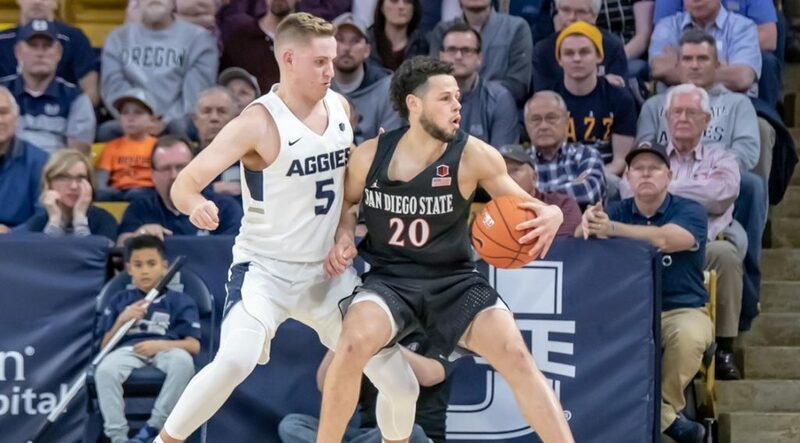 Things started out on a sour note and ended badly Tuesday night for San Diego State against Utah State in Logan, Utah. The first indication the night would not end well for the Aztecs (18-10, 10-5 Mountain West) was when the wireless microphone for the National Anthem singer died and the band had to take over. The second was when the Aztecs missed 17 of their first 20 shots. Utah State has never beaten SDSU in the 11 previous meetings since joining the Mountain West until Tuesday when it slaughtered the Aztecs, 70-54. Two of the Aztecs leading scorers were held to single digits Tuesday night. Jalen McDaniels, who averages 17 points per game coming into the matchup, was 3 of 10 for seven points. Devin Watson, the Aztecs second-leading scorer with an average of 16 points per game, was 2 of 14 for five points. The Aggies are in second place in the Mountain West with their only loss this season was to the Aztecs on Feb. 9, which started the Aztecs on their five-game winning streak. That also ended Tuesday night. The Aztecs’ bright spots of the night were Jordan Schakel and Matt Mitchell. Schakel led SDSU with 15 points and Mitchell added 12 points. San Diego State is now tied for third place in the Mountain West with Fresno State, which the Aztecs will face the following Thursday, March 6. That matchup is an important one. Assuming they beat last-place San Jose State this Saturday, the Aztecs could clinch the third seed in the conference championship, and avoid first-place Nevada until the final — if they beat the Bulldogs.